may have been abducted as well. When she is preparing to run for her life her little daughter is taken and the police suspects she might be responsible for that. Will she manage to persuade them she is a victim, not a perpetrator? This horror had one big flaw: the director failed to persuade me that his story rang true, despite the whole ‘mockumentary’ setting. The film had two components: dramatization, in which actors portrayed the individuals involved, and “documentary”, in which video footage purported to show the ‘actual’ victims undergoing hypnosis. It was a tad irritating to be honest, as if I needed to be constantly reminded about the basic premise but it wasn’t the worst. After a while I found the Aliens doing the abductions were really stupid, even if they, coming from Sumerian times, supposedly were not mere centuries but millenia old. Well, from stupidity to silliness is just one step and it is not good for your thriller when you smile, even laugh out loud. So: Aliens were cruel and stupid, Abbie was sad and stupid and the police, especially the town sheriff, were strangely blind, aggressive, and stupid. It leaves out a lovely owl but poor animal couldn’t do much. Mind you the creep factor was about assuming that what you’re watching is, in fact, true and that the homemade videos are all in fact legitimate. However I have to admit that the further I got into the film the more I had to suspend my disbelief until I reached a level of an utter ‘no way.’ Pity. 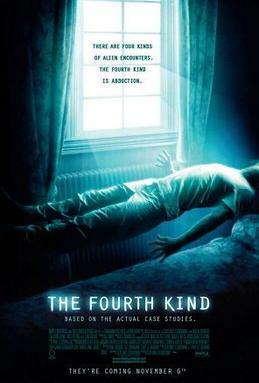 Despite an interesting premise The Fourth Kind wasn’t creepy, it was annoying. Only for avid fans of Blair Witch Project. This entry was posted in contemporary thriller/horror, dark fantasy, movie review and tagged alien abductions, annoying, contemporary horror story, heroine too stupid to live, olatunde osunsanmi, psychological movie, the fourth kind. Bookmark the permalink. The Blair Witch Project was one of these movies which could put me to sleep in 10-15 minutes. I guess mockumentary is rather not my thing.